He gave the assurance in Lagos while speaking at the party’s presidential rally. The Senate President, Dr Bukola Saraki; Atiku‘s running -mate, Mr Peter Obi; the PDP National Chairman, Prince Uche Secondus, were some of the prominent personalities at the rally. Former governor of Ekiti, Mr Ayo Fayose; former Ogun governor, Otunba Gbenga Daniel; Sen. Ben-Bruce, a former presidential spokesman, Chief Doyin Okupe; were also at the rally. Atiku and his entourage were welcome to the state by a former Deputy-National Chairman of PDP, Chief Olabode George and the party’s governorship candidate, Mr Jimi Agbaje and a mammoth crowd of party faithful. Atiku emphasised that he would not renege on his promise to restructure the country to fast track development. The PDP candidate said he would fulfil his promise to revamp the economy and create jobs. He said the spate of killings and other security challenges in the country was disturbing, promising to tackle the problem head-on. Atiku urged Nigerians to reject the All Progressives Congress (APC), saying the party had failed the people in all its electoral promises. “When I say I am going to do something, I am going to do it; I am not like APC that will promise something but will not fulfil them. “I promised Nigerians that I am going to restructure the country, I am going to do it. “I promised Nigerians I am going to create jobs, I have been creating jobs and I will create more jobs for you. “The APC promised to create jobs, but we have been losing jobs, we have the largest unemployment case in our history. “APC said they were going to improve security; we had security challenges only in the North East; today, we have insecurity in the North West, North Central, they have failed Nigerians. “They said they were going to revamp the economy, today, we are the headquarters of poverty in the world. “I promise you, I am going to reverse all these when I am elected”, he said. Atiku said Lagos residents deserved a better deal than they were currently getting from the APC government. The PDP said the problem of traffic and other problems were surmountable with the ideal government in place. He said he could vouch for the credibility, passion and capacity of Agbaje to move the state forward . Atiku urged Nigerians and Lagos residents to vote PDP from top to bottom for good governance . In his speech, Obi said the PDP was the best bet for the progress of the country and the well-being of citizens. He urged all Nigerians to cast their votes for the party on Feb. 16 and March 2 “for a better Nigeria “. Speaking, Saraki said a vote for Atiku was a vote for a better and a prosperous Nigeria . He said the PDP candidate had the capacity to revamp the economy and hence, create massive jobs for citizens. Saraki claimed the APC government had brought sufferings to the country, urging Lagos residents to reject the ruling party at the polls. “When you vote for Atiku Abubakar, you vote for a better economy, when you vote for a better economy, you vote for jobs, and when you vote for jobs for the youth,you vote for prosperity and a better Nigeria. 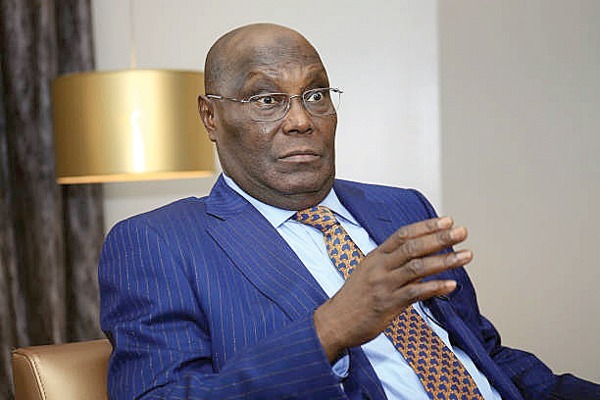 “I urge Nigerians, particularly Lagos residents, to end the sufferings in the country by rejecting the APC and voting for Atiku,” he said. Agbaje, in his speech, said the PDP and Atiku had solutions to all the problems bedevilling the country. He said it was time Lagos freed itself from what he called the political hegemony of people with vested interests, and embrace a government that truly cares. He said if elected, he would deliver service and provide the real governance that residents deserved.